Some people with Asperger's syndrome are actually quite good at shutting out pain while others seem to feel every single cut, bruise or scrape in the most traumatic way. It's also not unusual for a person with Asperger's syndrome to sit at both ends of the spectrum at more or less the same time. Different types of pain register quite differently. One of the biggest problems, particularly with babies with Asperger's syndrome, is that when there is a very real problem, they don't always make enough noise to have it taken seriously by their parents. It's not uncommon for a child with Asperger's to be, for example, "a quiet child who rarely cries" but turn out to have ear problems due to repeated ear infections. If you're lucky enough to have a quiet baby remember that if it does cry for a long period at some point, that small cry might be the equivalent of an all-day cry from a "frequent crier" baby. All kids do not express their pain equally. Some children seem to be overly sensitive and even the smallest of bumps will bring out the tears. At a young age, this is easy to dismiss but as the child grows older, it becomes a problem. 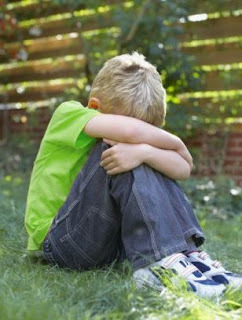 Children who "cry at the drop of a hat" can often lose friends over the problem. Making a rule that "big boys" or indeed "big girls", don't cry is an old, time-tested method. It's the method my parents used on me and I can confirm that it certainly does work as a method of getting the crying to stop. Unfortunately this is quite a harsh discipline by today's standards and it doesn't stop sadness but simply drives those feelings beneath the surface. Teaching children to suppress their feelings can lead to other problems as they get older. This is essentially the modern parent's knee-jerk reaction to the "Big Boys don't Cry" rule. Let them cry all they want and hope that eventually your child will grow out of it. This is actually a good policy for younger children and it's true that kids generally do eventually grow out of constant crying but it's quite possible that they'll set themselves up for bullying if they cry a lot in front of their peers at school. It's okay to let things go for a while but eventually they may need to be told to stop. If your child is approaching their teen years and is still a constant crier, then you really can't leave it any longer -- you need to get involved. Does your child exhibit unusual sensitivity to light, to touch or to sounds or smells? If so, it's possible that your child has Sensory Processing Disorder (SPD). Usually this is picked up at an early age but sometimes it can remain hidden for years. SPD could mean that your child is experiencing constant discomfort as they navigate their world. Sometimes, just a few simple changes, such as noise reducing headphones or glasses with Irlen Coloured Lenses can reduce that discomfort to a more manageable level. Has your child experienced psychological trauma? Normally people mentally associate psychological trauma with child abuse but that's not necessarily the case. Children are very sensitive to the world around them and they take a lot of "background" information on board. For example, if you've been busy helping a close friend or relative with a debilitating and/or traumatic illness, such as cancer, you may be surprised by how much of that trauma your child is taking on board. Clear signs could include an unreasonable fear of doctors, hospitals or medications ... or simply clingyness. If you happen to see a moment when your child is clearly emotional but manages to control their sadness, be sure to praise it (just not "in the moment"). Wait until your child has put significant distance between the event and when you're by yourselves. After all, even discussing a distressing event can bring memories of it flooding back and undo all their hard work. That's okay though, you're not trying to suppress tears when you're alone (everyone cries when they're alone), you're trying to prevent them in a public place where they could lead to exclusion and ridicule. Tell your child; "I saw that you managed to not cry when xyz happened. I'm so proud of you for holding yourself together. That's very grown up behaviour". Then, let the matter drop. Don't harp on about it because if your child has managed to let it go, you should too. If your child looks like they're struggling in a social situation, help them find the words to excuse themselves. Teach them that they can ask to go to the bathroom or call for "time-out" or ask for a bit of "space". Sometimes you'll have to say the words for them but eventually they'll be able to follow their own initiative. Your child is bound to slip up at some point. Remind them that everyone has bad days every now and then. That's okay. Don't dwell on failings, just help them pull themselves together and move past it. Better luck next time. As your child becomes more centred and less emotional, they'll usually find that their new-found stability makes them easier to be friends with. A little stability can lead to a significant increase in overall happiness. It's kind of funny but this makes me think of when I was younger. As a baby I didn't cry much, there's actually a story about my aunt babysitting me and me falling, apparently I just sat there. This completely explains how I could fall and scrape myself and not stop playing while everyone else freaked out over how bad my wounds were. Of course then I'd cry over the idea of getting them cleaned because I couldn't stand to be touched. I haven't been officially diagnosed with anything (mainly because my psychiatrist made me anxious and I quit going) but I'm pretty sure if I had, posts like this would have helped my parents deal with me better when I was younger. Just, great posts.